Without a doubt, club instruction is the best method of RC airplane flight training and is the option you should choose if you want to jump in at the deep end with an RC airplane and you have no experience whatsoever. Our club has experienced RC pilots who are willing to teach. 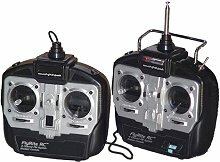 The first one is the traditional method of side-by-side instruction, either by sharing a single transmitter or, more commonly, using a buddy box system. The buddy box system is a much better way of learning, and you and your instructor each hold a separate transmitter. In conventional BB systems, the transmitters are joined together by a cable; the instructor holds the master transmitter while you, the student holds the slave transmitter. With the flick of a switch, the instructor can hand over or take away complete control from you, without having to take the transmitter from your hands. The system shown above is a true buddy box system whereby the slave Tx (left) can only ever be used with the master Tx (right). In other words, the slave transmitter is not a real one and cannot transmit an actual radio signal. But the majority of modern radio control transmitters have a buddy box training capability, so two actual transmitters can be connected to each other and neither of them is a 'dummy'. Whereas a cable connection between the two transmitters is commonplace, modern radios are increasingly incorporating a wireless buddy connection. As with everything, this method will become the norm with time, I'm sure. For those interested in flight training from some of our more experienced pilots, the following list of members will be available to assist and to teach you on how to fly your airplane. All new pilot training will be conducted at the MVMAC Las Cruces RC Flying Field for safety purposes. You can contact any of our instructors by phone or check our Event Calendar to come out to any of our public events. Don't try flying by yourself. Don't crash your plane. If you've never flown before, it is harder then it looks!! !